Posted on May 2, 2014	by Katy K.
I was planning on doing a whole post about why we need diverse books, because there’s this whole campaign going on right now that you might have heard about. Then I actually looked at the We Need Diverse Books tumblr and I don’t know that I have a lot to add in words, though we set up a couple of displays at the library. Everyone needs windows into themselves and into other people. Nobody is served if everyone thinks that stories of white, straight people are the only ones that matter – neither the people at the center of those stories, nor those who stories are silenced. As one person aptly put it, no kid ever asked for a box of 64 white crayons. You can also check out the Lee and Low Buzzfeed list of highlights from the Tumbler. I’m coming in halfway through a three-day event – May 1 devoted to posting pictures, May 2 to a twitter chat on the topic, and May 3 to encouraging people to buy diverse books and/or request them from their library, because book publishing is a business. I think about diversity in books a lot, though I know my reading isn’t as diverse as I’d like it to be. Most often, I’ve focused on racial differences, but this campaign has clearly been looking representation of diversity in sexual orientation and mental health as well. And by good chance, today I have book for you featuring mental diversity. Billy the Kid Is Not Crazy by S.F. Guerra. Illustrations by James Davies. Amazon Children’s Publishing, 2013. Billy is a nice, well-meaning kid, but his overactive imagination is always getting him into trouble. He means well, he promises to be better – but by the time he realizes he’s getting carried away again, he’s already done something like writing in pen in a school text book that turns out not to be a secret coded message. When playing Clone Wars with shopping carts – aka droids – in a parking lot ends up with a car getting damaged, his parents decide to take him to a shrink. He is horrified! His active imagination amplifies the worries: Will the doctor put him on “drugs”? Will his father get tired enough of him to send him away and look for a better son? And will Billy ever get his dream – a cell phone of his very own? 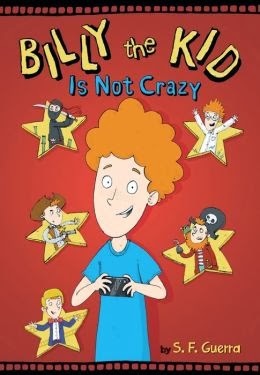 The story is told in the popular text-comic strip hybrid format, with Billy’s imaginary adventures, worries, and the occasional video message to his parents shown in comic form, an excellent choice. This is clearly an “issue book”, and I was worried about it feeling preachy. But Billy came to life so believably, so full of fun and good intentions gone awry, that I couldn’t help being sucked in. As a mother, I was really distressed at his parents’ failure to reassure him along the way, but even though that aspect felt somewhat overdone, the ending still made me teary. I found myself arguing with his diagnoses and treatment plan – it looked like he had a serious impulse control issue that wasn’t labeled as such. Would labeling it help? If that was the problem, is just finding a really good reward the right solution? But these are technical quibbles that I don’t think would affect the book being enjoyed by the target audience. I also sighed just a little bit because Billy, while on the one hand illustrating mental/behavior issues much more commonly found in real life than in books, on the other hand sticks very closely to the limits of deviations from neutral that Shannon Hale discusses so well : he is white and male (though I know the author is female and am guessing by her name that she’s Latina) and mainstream Christian, and 10 – a good average age for a middle grade book. Though I don’t know that I’m going to argue with the author on her decisions with that, while we’re talking about diversity, I do notice that the issues that the book is about are the only deviations from neutral that our lead is allowed. On the whole, this is a very fun book that’s great for normalizing the idea of people needing mental help from time to time without being over-the-edge crazy, and that will appeal to fans of books like Diary of a Wimpy Kid and Dork Diaries. This book was kindly sent to me by the author, and has been passed on to the library where I work. This entry was posted in Books and tagged #weNeedDiverseBooks, diversity, realistic fiction, S.F. Guerra, youth fiction. Bookmark the permalink.